Your Home & Garden features six mini-magazines in one. ‘Your Shopping’ covers trends, products and places, while ‘Your Stories’ showcases people, decor, styling and colour workshops. 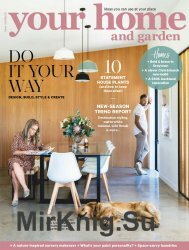 ‘Your Homes’ features at least four New Zealand homes packed with creativity, colour and Kiwi ingenuity, plus floorplans and practical info including supplier and tradesmen recommendations. ‘Your Gardens’ features design workshops, outdoor makeovers, the latest outdoor products and picking plus planting advice.